WHY SETTLE FOR A BORING GIFT, when you can give them a classy and personalized 1988 wine glass that they can use for years to come. 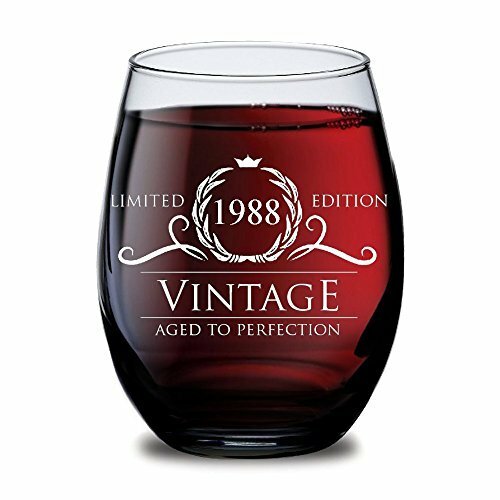 These Limited Edition Aged to Perfection wine glasses are sure to be a huge hit at the next 30 year old birthday party, thirty wedding anniversary celebration or class reunion. BEAUTIFUL AND TIMELESS DESIGN. The exquisite teardrop shape of the stemless wine glass fits perfectly in your hand. It's simple yet elegant design is sure to please the wine lover in your life. A generous 15 oz glass is perfect for red, white, pinot noir, cabernet and rose wines. LOOKING FOR AMAZING PARTY FAVORS AND DECORATIONS? We've got the perfect show stopper for all of your guests. They'll be thrilled to have their favorite glass of wine from these beautifully crafted glasses. Buy them as a set of 2, 4, 6, 12 or even more to make your big milestone event truly special. A GREAT GIFT FOR THE PERSON WHO's GOT EVERYTHING. See your mom or dad smile as they open the fun gift box at their wedding anniversary party. Your husband or wife will cherish this wine glass with their birth year on it. Your best friend will tell you that you found their new favorite wine glass for your next girls night out. The class reunion will be kicked up a notch as your classmates give a toast to lifelong friendships.